We are thrilled to share with you our 2017 Annual Donor Update. As you’ll read in the update, this year we broadened our science and advocacy efforts on behalf of all those who treasure a healthy Deschutes River. Our science team has expanded their invaluable research into the causes and extent of the ecological changes occurring in the river, and we’ve used that research to advocate forcefully for necessary management changes at the Pelton Round Butte complex. This advocacy includes our lawsuit against Portland General Electric, where this year we won a powerful victory protecting the rights of citizens to enforce critical water quality standards. As always, none of this work would be happening without the support of our many donors: the individuals, corporations, foundations, and fellow environmental organizations that make it possible for the DRA to accomplish our mission. We’re sincerely grateful for all your support, and are excited to share our many accomplishments with you, along with our big plans for 2018 and beyond. 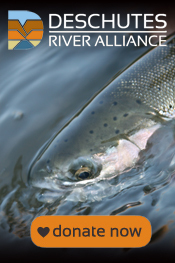 With your support, we will restore cooler, cleaner water to the lower Deschutes River. Click here to read about our many successes this year, and how we plan to keep it going in 2018. And if you would like to make a donation towards our programs in 2018, please click here. Wishing you all the best this holiday season. Here’s to another great year in 2018!